Encapsulated in relating to people with prestige and dignity. This philosophy of health care as unique in comparison to the more traditional models of physiotherapy at the time. 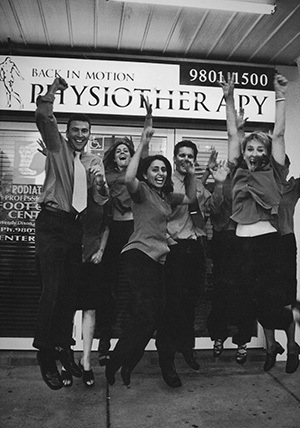 Back In Motion was launched as a small practice in the home of founders Jason and Paulina Smith in September 1999. Their early success resulted in quick growth and by April 2000 they had moved the practice from their home into more suitable commercial medical facilities. An expert and committed team soon gathered around Jason and Paulina as they focused on emerging as one of the choice physiotherapy providers and employers in the industry. In 2006, Back In Motion embarked on a major growth phase which continues to this day. From seven practices in early 2006 to more than 100 locations across Australia in 2017, the future is bright and exciting. We have now established a unique health group of physiotherapy and wellness practices fuelled by a passionate vision to build a leading physiotherapy brand delivering optimal lifelong physical health to all Australians.